It’s been a little busy around here lately! 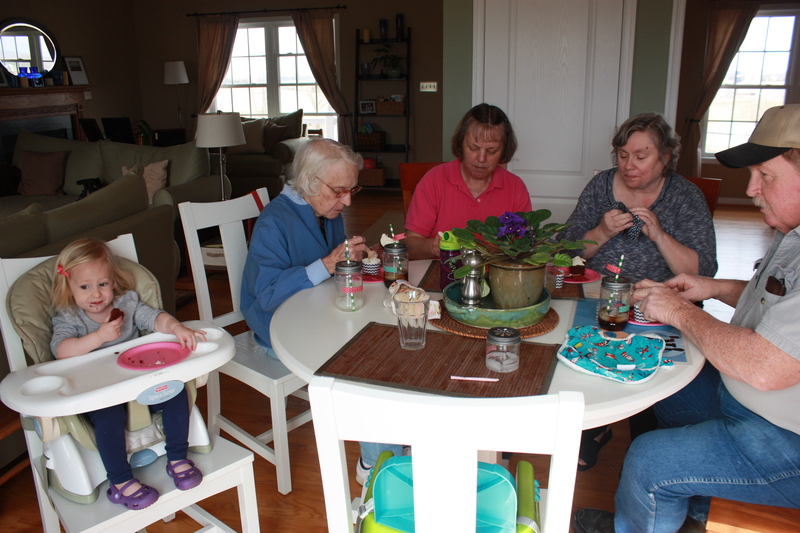 On Sunday, my college roommate and her family visited for part of the afternoon. 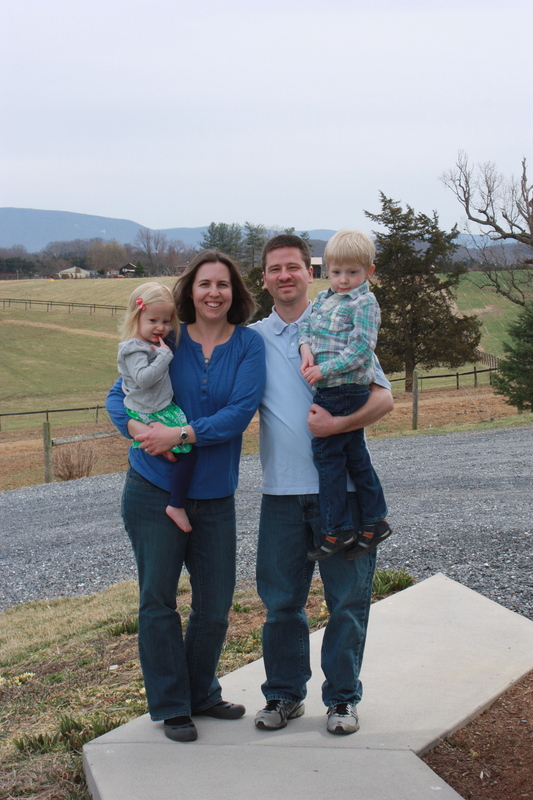 They travel to Tennessee to visit family and occasionally have time to visit on their way through. We hadn’t seen them since Harper was a few months old, so it had been a while! My roommate’s youngest daughter is one month older than Harper, so it was lots of fun to watch them play together! 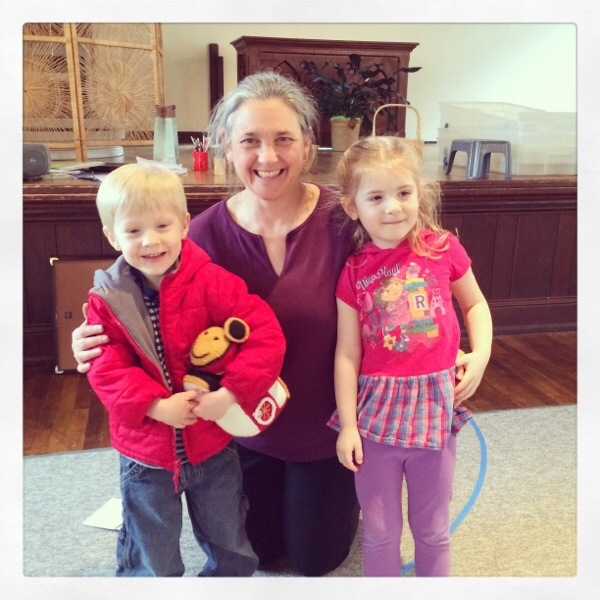 Will had music class on Sunday and Monday, which wrapped up his Musikgarten classes until the fall. His teacher offers a short spring session but things are way too busy at school in May for me to take him and Harper to class. Here’s a pic of Will, one of his music friends, and Ms. Sarah, the teacher. Friends of ours came over Sunday evening right after music class to visit. They are building a house right up the road from us and are using the same contractor we used. They wanted to talk house stuff! 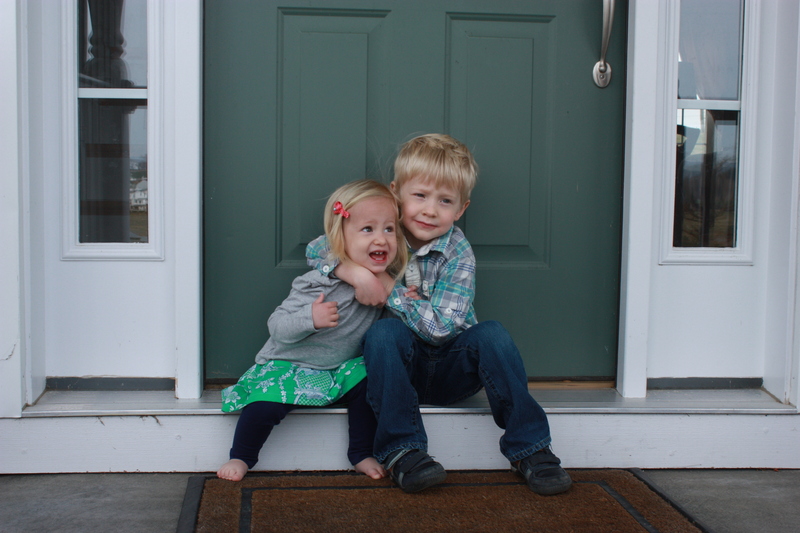 I had to go back through our old house files to get more specific info for them…it’s been seven years since we built! My how time flies by! My friend has four children, so Will and Harper got to play with them. Her youngest daughter is two days younger than Will. We were both in the hospital at the same time! I first met her back in the early 2000s when we were getting our master’s degree in education. I ended up teaching middle school special education with her for several years. She now works at a high school and I work at an elementary school, so we don’t see each other as much. It was great to catch up with them! Today, I had an eye doctor and dentist appointment. Such fun! Not! 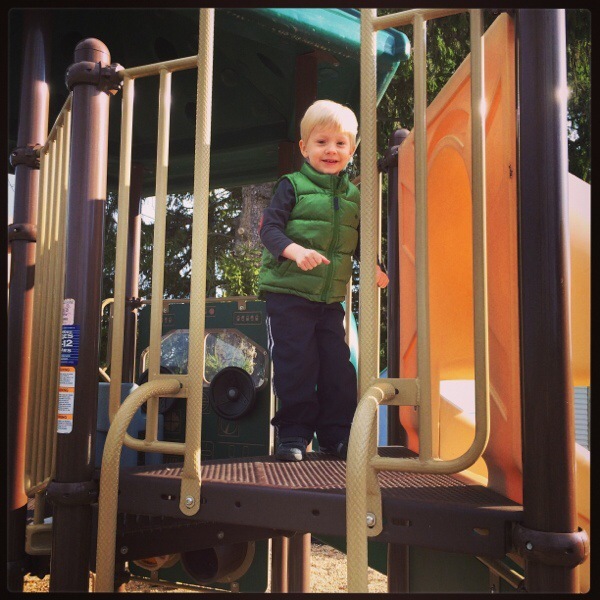 However, it meant that I took the day off work and was able to take Will to preschool. Since I work full time, my babysitter takes Will to preschool twice a week. 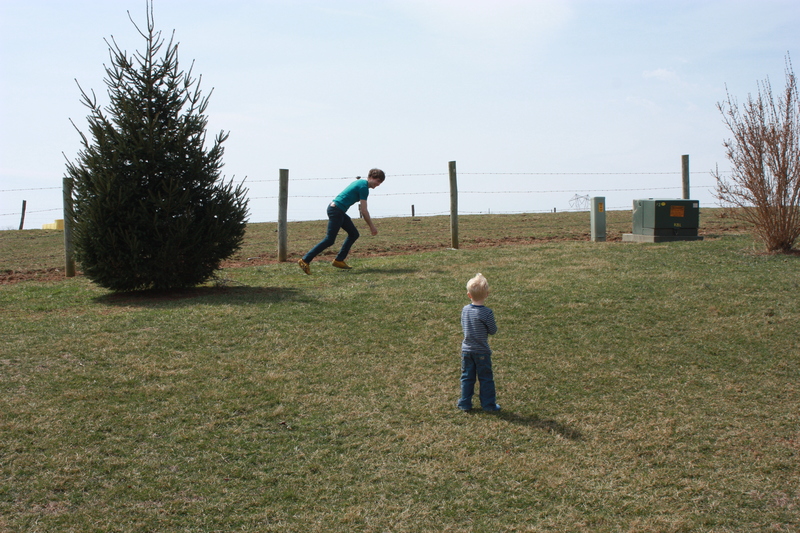 I have only taken him once this year, and that was when I went on his pumpkin patch field trip. He showed me the whole preschool drop-off routine, where to park, how to sign in, etc. It was so fun! I brought Harper along as well. She wanted to stay with the rest of the kiddos! After picking up Will at preschool and dropping him off at Nana’s, I headed to the dentist. Fun, fun! While I was there, I scheduled Will’s first dentist appointment for the summer! He’s looking forward to going to the dentist and actually wanted to go with me today. I had a little time in between my dentist appointment and my eye doctor’s appointment, so I stopped by Panera for a quick bite to eat. I hate eating out by myself (and rarely do), but it wasn’t too bad at Panera. I ate a yummy chicken apple salad and read blogs…it was actually quite enjoyable! I stopped by Target and Michaels to get some party items for Will’s upcoming 4th Lego birthday party. Then off to the eye doctor. I have had some vision concerns lately and on Friday, I noticed some weird things happening with my vision. I immediately called my eye doctor and they recommended that I come in. At my appointment, they determined that I had an ocular migraine last week. Not a big deal but I need to continue to monitor and see how often they occur. It initially scared me because of a recent eye diagnosis and some vision issues I need to monitor on a daily basis. After the eye appointment, I took Harper to her last music class. We rushed home so we could enjoy the beautiful spring weather! 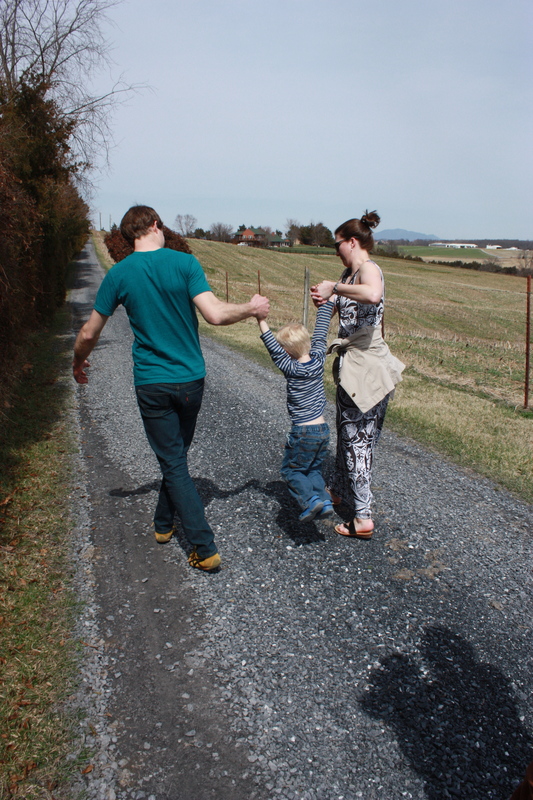 We went with our neighbors to see Shadow and Isaac, a horse and donkey that live up the road. Here’s to a more relaxing day tomorrow (but it’s back to work, boo). 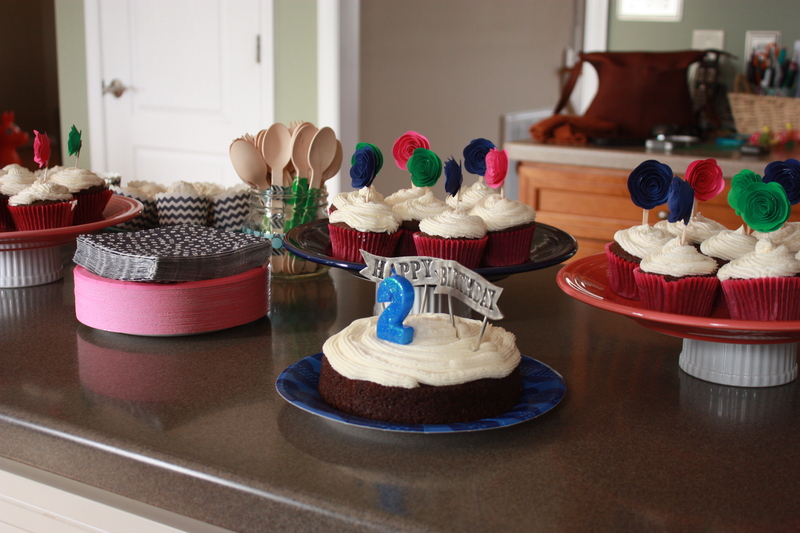 We celebrated our sweet Harper’s second birthday party on Saturday! It was so much fun celebrating with our family and close friends! What a beautiful day as well-the temps were in the high 60s-so gorgeous! 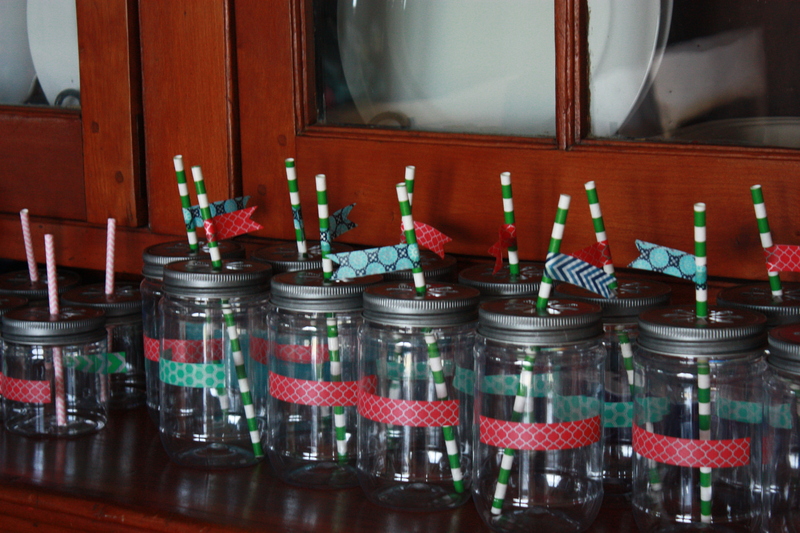 I based Harper’s birthday theme loosely around mason jars and incorporated green, navy blue, and pink. I purchased this cute mason jar invite on Etsy to kick off the theme. Sorry for the blacked out portions…when I started this blog and decided to use my kiddos’ middle names when referring to them, I never knew how difficult it would be and how careful I would need to be to make sure their first names or initials were not in any of the pictures I posted, ha! Our yearly family birthday pic! We started this when Will turned one-we make sure we snap a picture at each birthday party. The cupcake and ice cream spread! I decorated wooden spoons with washi tape and bought some cute flower cupcake toppers on Etsy. For cake stands, I used several white ramekins and put colorful Fiestaware plates on top. To save time, I always pre-scoop out the ice cream in individual candy cups and pop them back in the freezer. In this picture, the ice cream is in the white and blue chevron cups. It’s so easy for the guests to pick up a cupcake and a cup of ice cream. Since I wanted to use my Lisa Leonard “Happy Birthday” topper, I made Miss Harper a mini cake. I created a display of Instagram prints that spanned from March 2013-March 2014 and organized them in chronological order with mini washi tape clothespins. 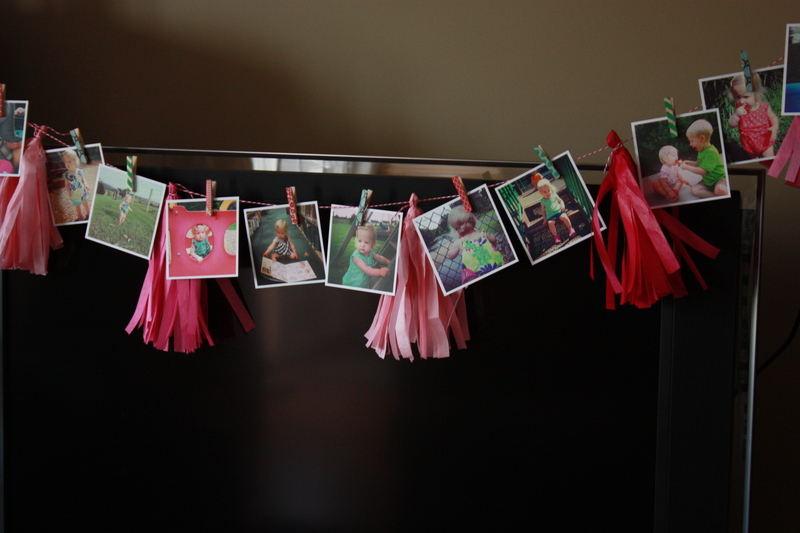 In our dining room, I hung one of the displays and attached a few tissue paper tassels I made. 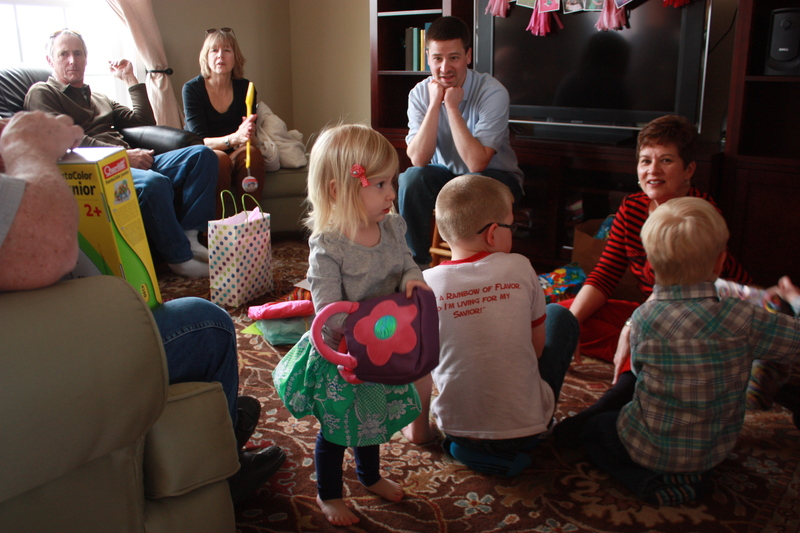 Below the banner, our guests placed the gifts for Harper. Here’s the second Instagram display (this one was in the living room). On the buffet in the dining room, I spread out our mason jars with daisy lids. I created the washi flags initially for guests to write their names on them but at the last minute, I decided it would be easier to stick a piece of washi tape on the cup where guests could more easily write their names. Medium size cups for the adults and mini size mason jars for the kiddos. I’m loving the paper straws-so pretty! One downfall, however, is that they tend to get soggy. 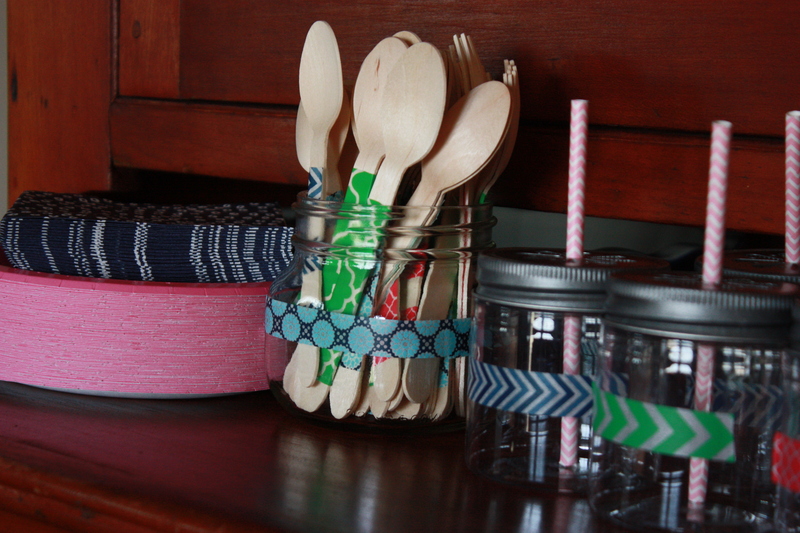 I used a mason jar decorated with washi tape to hold the wooden washi tape spoons and forks. Miss Harper snuggling with her Uncle E. We attempted to put her down for an early nap (her party was at 3), but our family started arriving around 1 and Harper was not about the miss the excitement! She’s playing peek-a-boo with me! 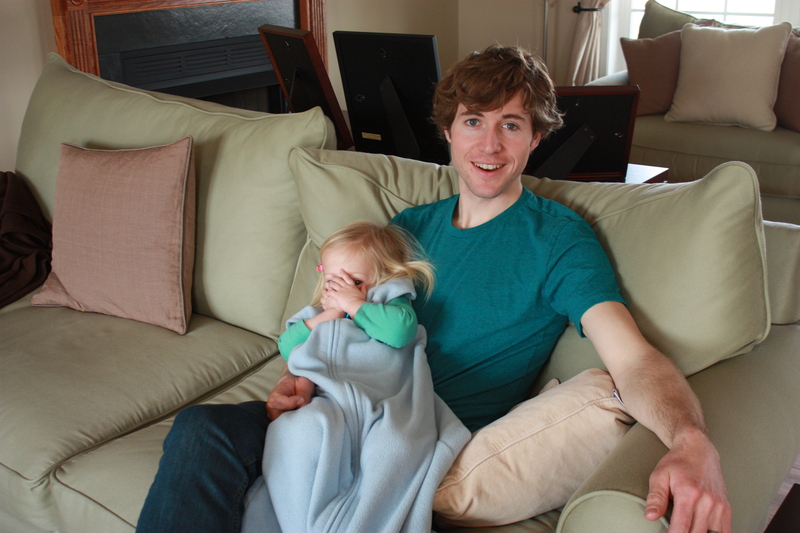 Will playing hide-and-seek with Uncle E. He loved it! Snapping some pics before the party. 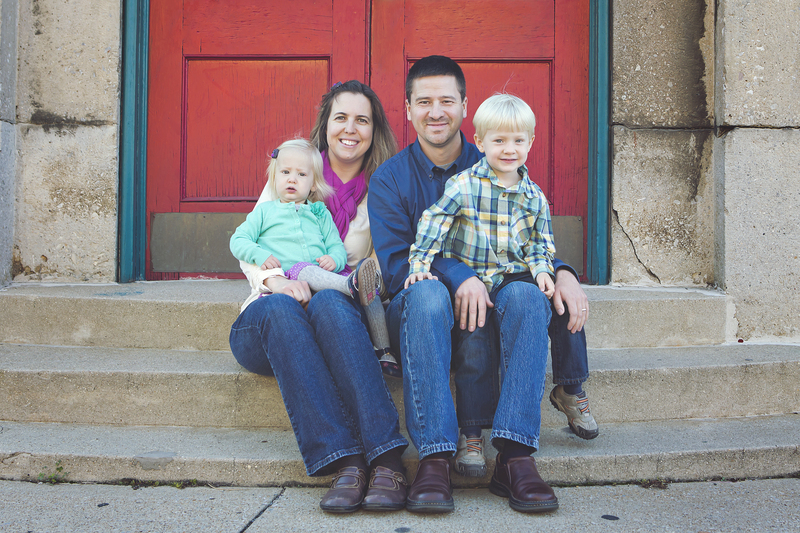 Since both kiddos are young, their birthday parties are very casual and small. We invited both of our parents, my brother and sister-in-law (who live in NC-we were so excited they drove up for the party! 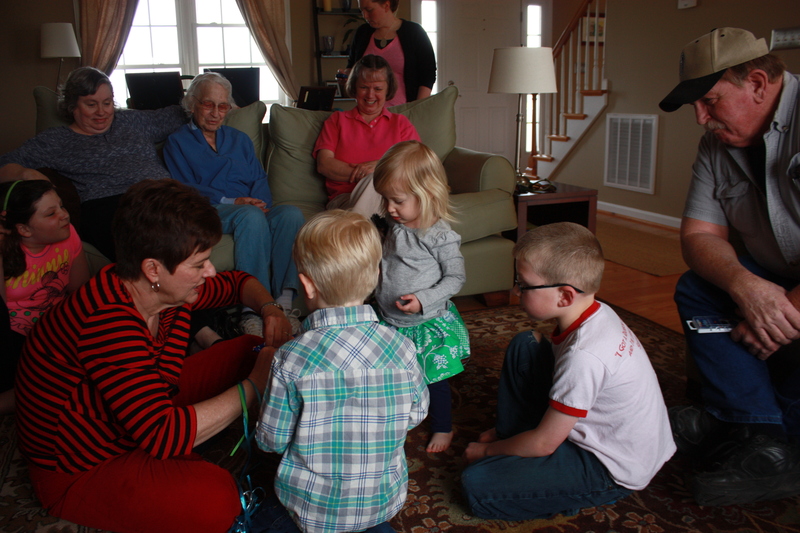 ), Nana, Pops, Maw, Aunt Kathy (the kiddos’ extended “grandparents”-their babysitters), and our neighbor and her kiddos. Will and my mother-in-law helped Harper open up her gifts. She had a blast, and so did Will! He wanted to open all of her gifts, ha! 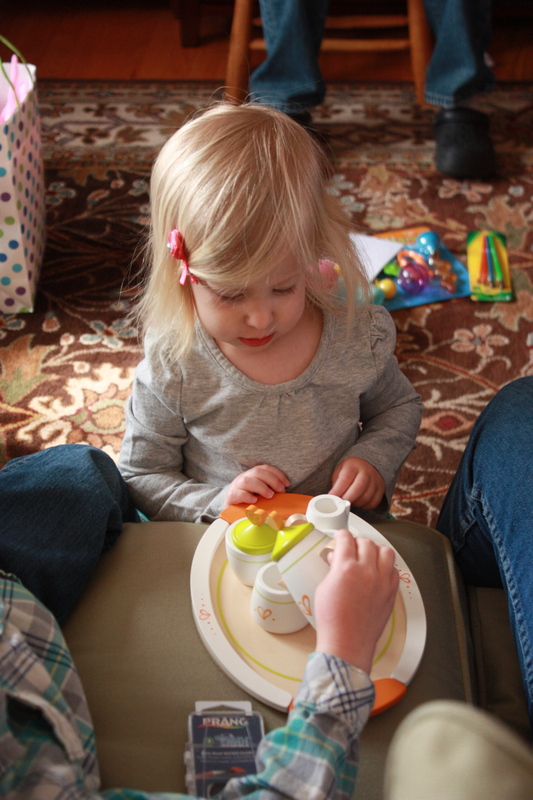 Playing with her new tea set. Harper received so many nice gifts! An alphabet puzzle, two dresses, a summer outfit, several books, a tea set, purse, arts and craft supplies, and several other wonderful presents. 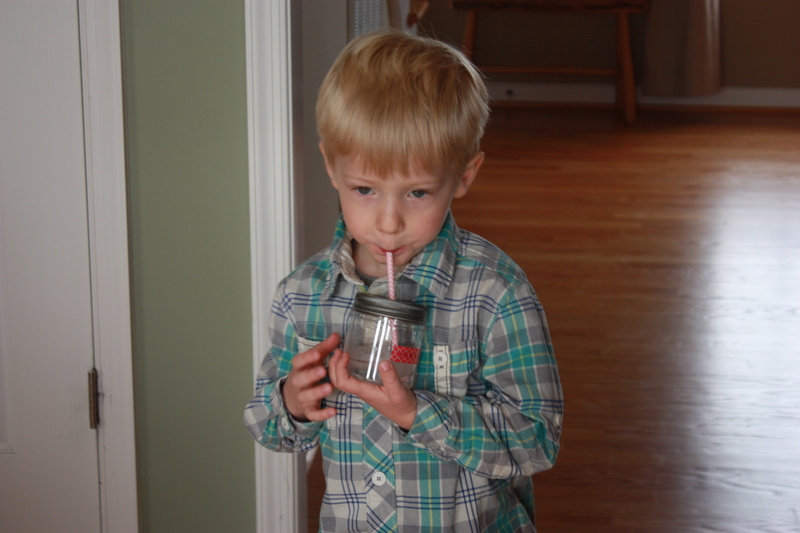 Will sipping lemonade from a mason jar. We put the cake in front of Harper and tried to get her to blow out the candle. Instead, she wanted to put her finger in the flame. Ouch! I made an easy chocolate cake (family recipe) and some delicious whipped cream/cream cheese frosting. I watched this tutorial from Carolina Charm on how to frost a cupcake. Mine didn’t look as nice as hers, but they looked a lot better than in previous years! All of Harper’s babysitters:) She loves them so much! 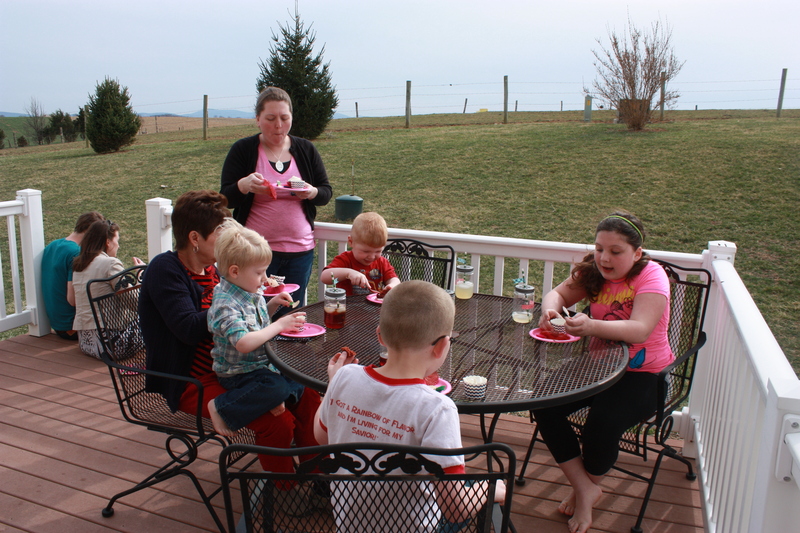 Enjoying cake and ice cream outside. 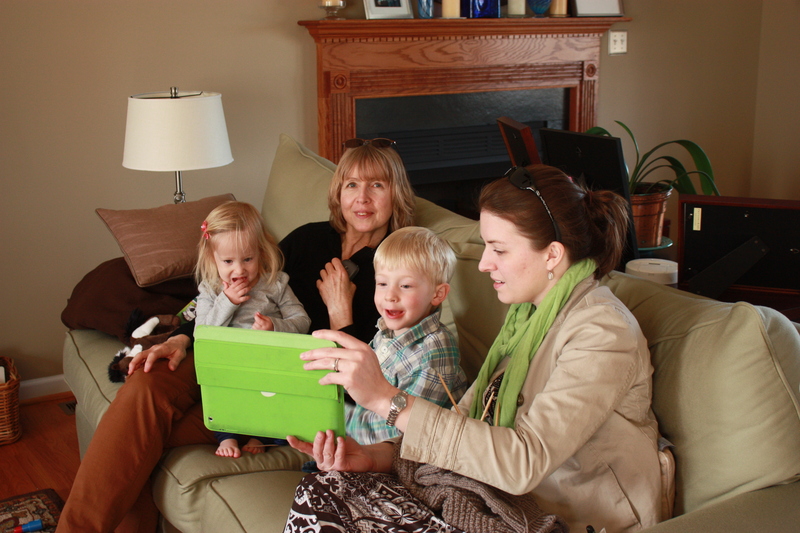 Face-timing with Harper and Will’s cousins in Colorado. After the party was over, we had dinner for our immediate family. I made an easy chicken parmesan bake and my mom brought a yummy salad. My mother-in-law made a squash casserole and brought garlic knots. We enjoyed a great dinner and spent some time visiting later that evening. 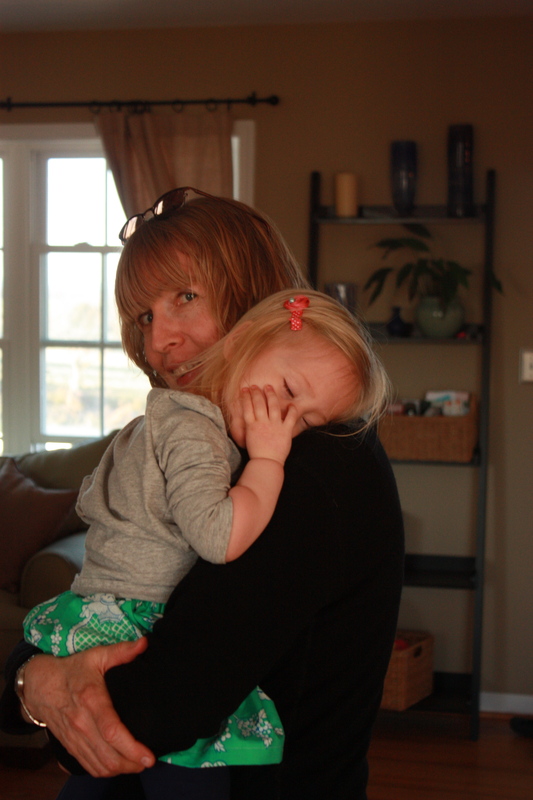 Sound asleep on Grammy-exhausted from the super fun day! We are so blessed to have amazing family and friends! Harper had a wonderful 2nd birthday! 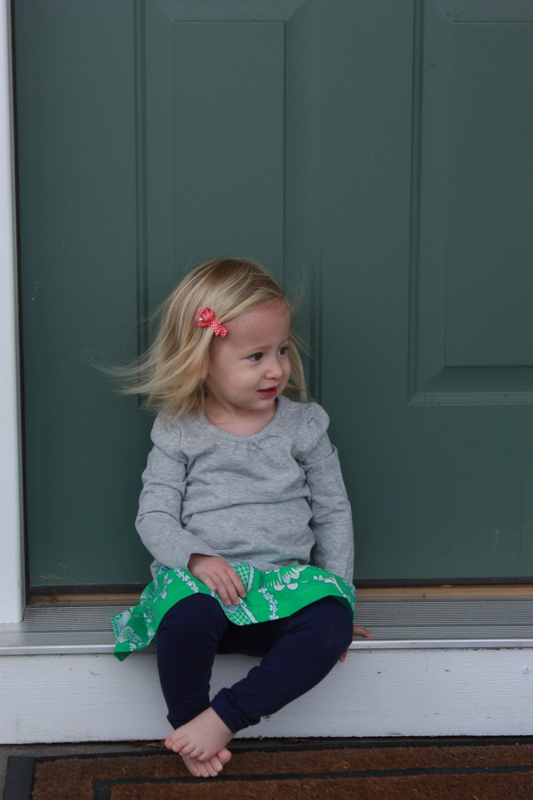 Harper’s Green Skirt from Laken and Lila on Etsy (I love her skirts and dresses! It’s been a tradition for Harper to wear a dress or skirt from Laken and Lila each year for her birthday). P.S. As you can see, I’m a little obsessed with Etsy and Target! Ha! They both have tons of great party supplies! Now it’s off to start working on Will’s 4th birthday party (Lego themed), which is coming up soon (at the end of April, yikes!)! I’m just a little obsessed lately with mason jars! They are so versatile and can be used for so many things. Growing up, my family had several large gardens and we canned and froze lots of vegetables and fruits. While I don’t use mason jars nowadays for canning (the whole process of canning scares me-using the pressure cooker-I was and still am afraid of using a pressure cooker), I have gotten into using them more recently for storage. One of our goals several years ago was to get away from using plastic containers for food storage and other storage, so mason jars are perfect for this! Here’s a small sampling of my current uses for mason jars around the house. 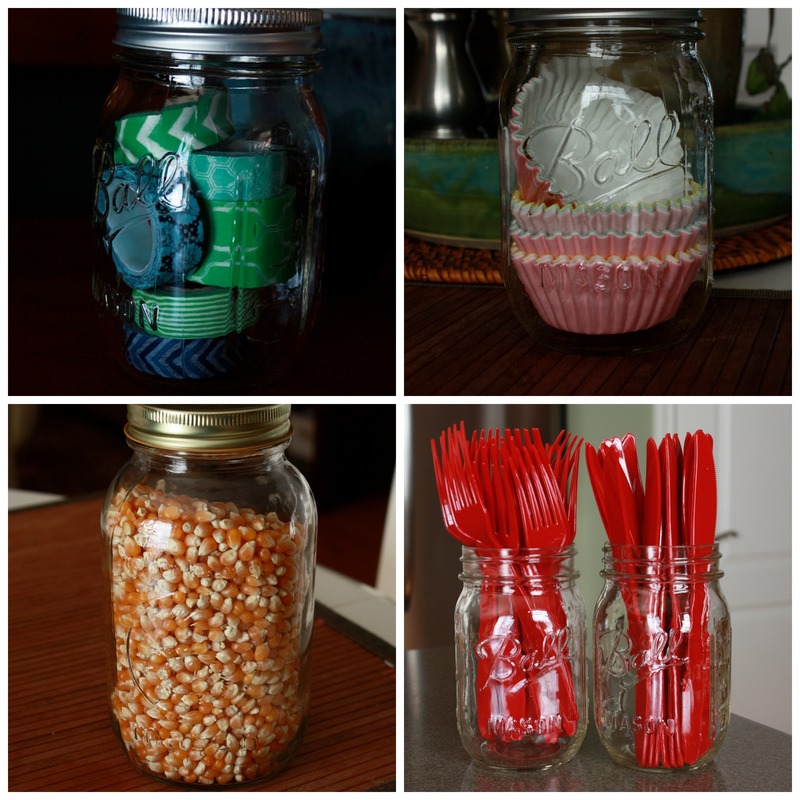 Pinterest has many ideas on ways to use mason jars. 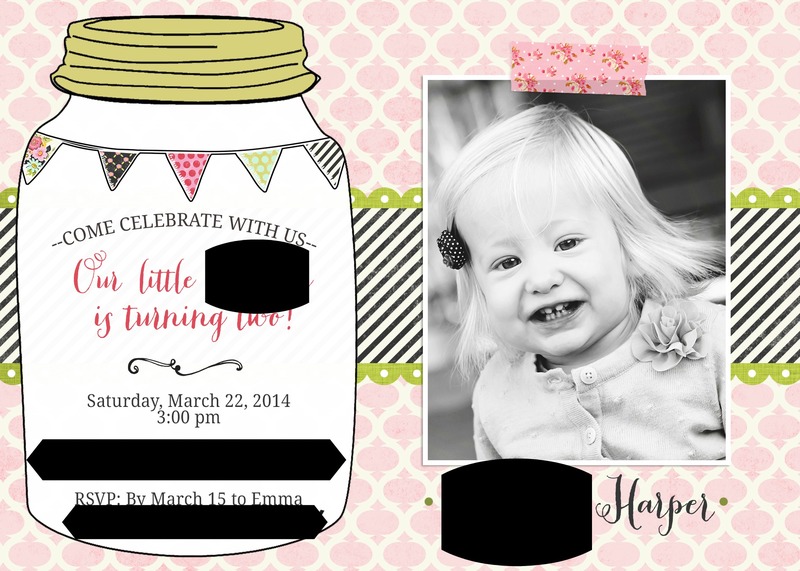 Harper’s 2nd birthday theme is even loosely based around mason jars! BTW, have you seen the beautiful green and blue mason jars?! So, so pretty! What do you use mason jars for? Good morning! 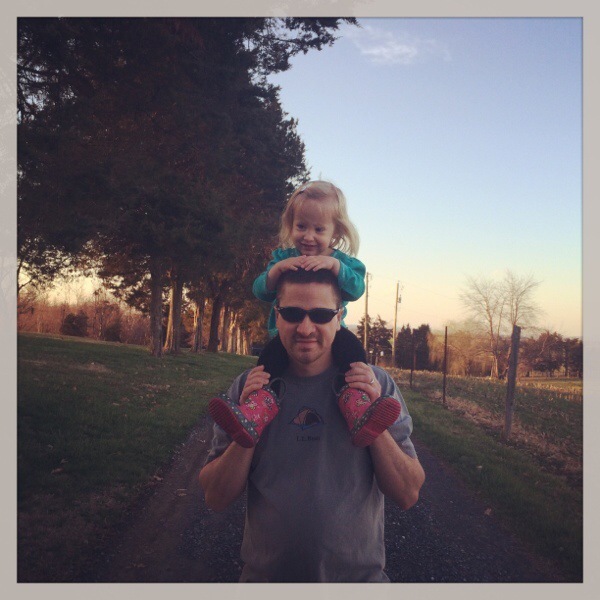 Today’s post will be one of several that focuses on party prep for Miss Harper. She turns two on the first day of spring (March 20th! 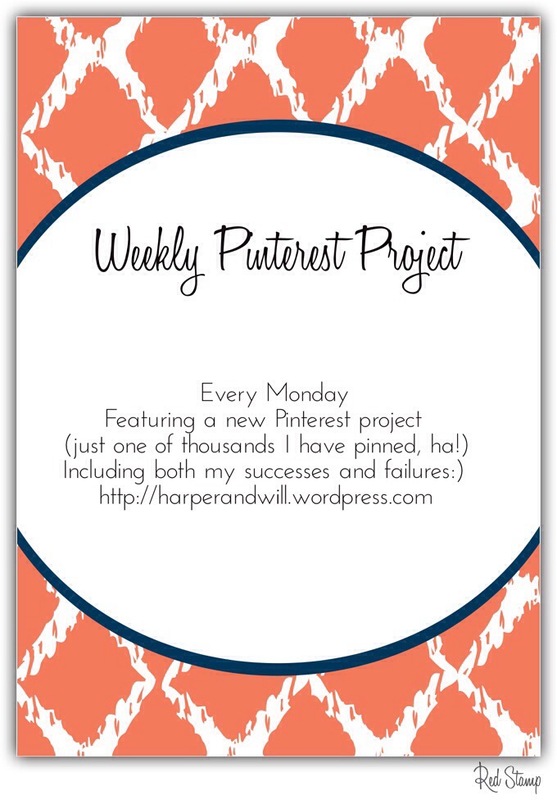 ), and since I like to plan and prepare well in advance, I started pinning ideas months ago. The theme has changed several times, but I have finally settled on a mason jar party with colors of blue, green, and hints of pink. I’m not super big on character or overly girly themes, so the use of mason jars seemed like a fun thing to do! 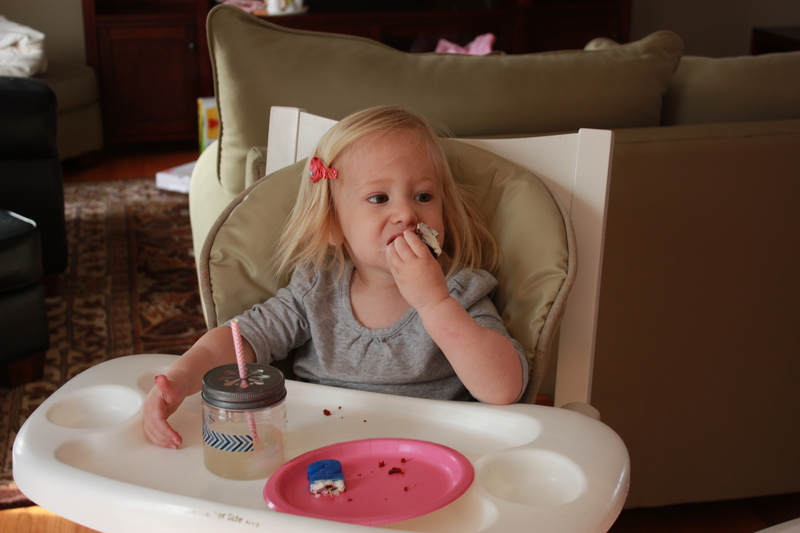 Last year, Harper’s first birthday was a pinwheel theme with blues and corals. I wanted a way to display some Instagram prints of her second year, so I created some Washi covered mini clothes pins. 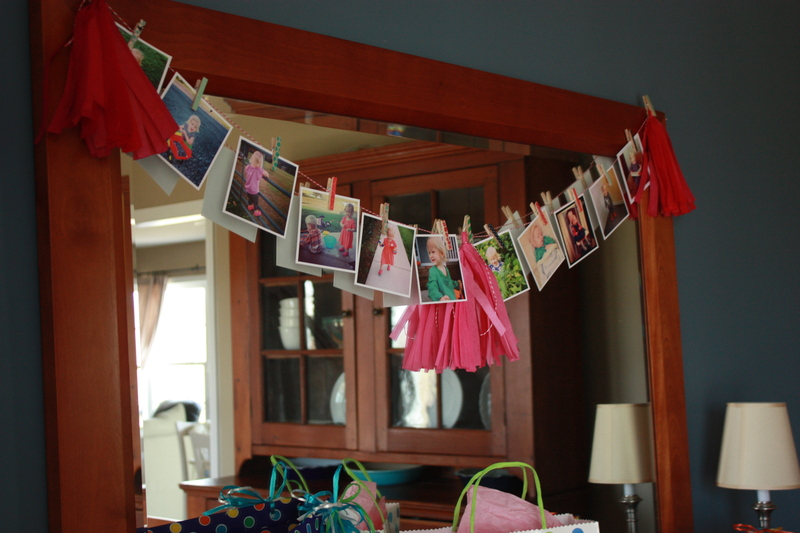 I plan on hanging some of my favorite Instagram prints of Harper in the dining room, using the mini clothes pins. These were so, so easy to make. 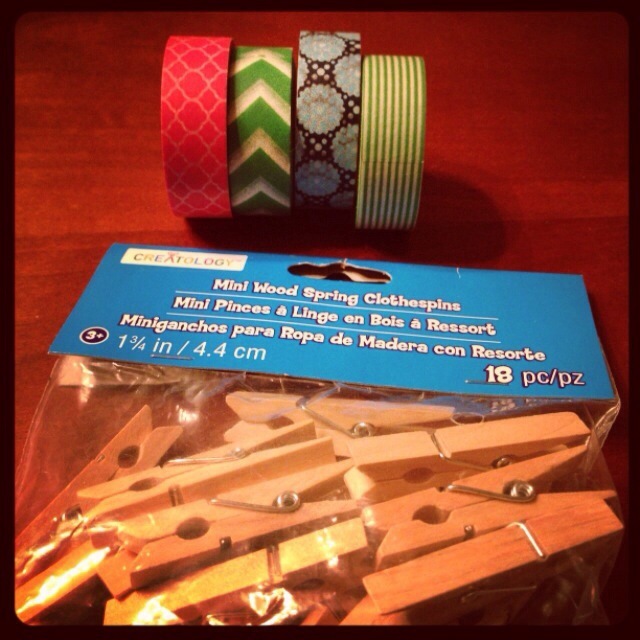 All you need are some mini (or regular sized-depending on your project) clothespins and some fun Washi tape. Where have I been all these years? This was the second time I have used Washi tape (the first time was just a few weeks ago-I still need to write the post detailing my DIY magnetic alphabet boards) and it’s the coolest stuff! It comes in the prettiest colors and patterns and you can do so many projects with it! I cut off pieces of tape and attached them to the clothespins. 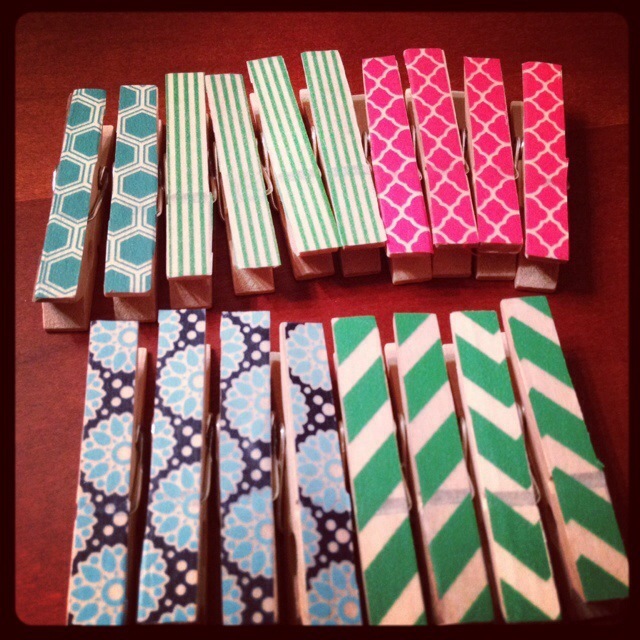 Next, I trimmed the excess tape and voila, some pretty Washi colored mini clothespins! You could even attach a magnetic strip to the back to turn them into magnets.